An all-new 4.5L V-8 Duramax turbodiesel, planned for light-duty pickups but shelved by GM as it buckled down for bankruptcy, remains on the shelf &#8211; for now. PLYMOUTH, MI – General Motors Co. launches an all-new fullsize heavy-duty pickup truck with new underpinnings and a revamped diesel engine later this year, hoping a still-depressed housing market improves to help buoy sales. 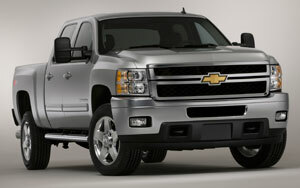 The redesigned for-’11 Chevrolet Silverado HD arrives at dealers this summer. The truck features an extensively reworked chassis, which GM promises will deliver segment-best towing and payload, as well as unmatched drivability. An optional 6.6L Duramax turbocharged diesel engine will deliver class-leading fuel economy and power numbers, the auto maker claims. Exterior styling changes are minimal, excepting slight design tweaks to the hood, front bumper and grille, plus optional 20-in. wheels. The 16-in. wheels are dropped, while 17-in. and 18-in. remain. The all-new chassis for GM’s heavy-duty lineup, which will add a GMC Sierra variant, is the first since 2001. More than 60% of the part numbers for the Duramax are new. The diesel powertrain also receives a strengthened Allision 1000 6-speed transmission. All signs point to a well-updated truck for arguably the industry’s most discriminating customer. But it remains unclear how it might fare in a segment pinched badly by the recession and the flight of recreational buyers to other segments after fuel prices spiked two years ago. According to Ward’s data, HD truck sales were down 17% last year, compared with 2008, and off 33% against like-2007. Over the 3-year period, Chevy Silverado sales fell 24%, while GMC Sierra deliveries slid 30%. Only the Dodge Ram has been able to maintain sales momentum, using its new-for-’10 HD pickup to rebound to 2007 levels after plunging alongside the industry in 2008. That could be good news for GM, the third-best seller in the segment for the last three years, behind Dodge and segment-leader Ford Motor Co.’s F-Series. Rick Scheidt, executive director-product marketing, Chevrolet fullsize and midsize trucks, admits the market may remain a bit soft. According to the U.S. Census Bureau, housing starts in 2009 tumbled 39% compared with 2008. Housing completions fell 29% in the same period. “There’s no doubt the truck business parallels housing starts,” Scheidt tells Ward’s during a preview of the new Chevy Silverado HD here. “No question that the market is down. Heavy duties comprise about 30% of GM’s overall pickup business, and sales of the big trucks are considerably profitable. The Silverado HD’s new chassis comprises 11 fully boxed frame assemblies to meet the pickup’s swath of buyers – from folks seeking the conventional pickup with cab and box to dually and chassis-cab customers. “This is really where our focus has been, this (frame) and the powertrain,” says Rick Spina, GM global vehicle line executive for fullsize trucks. He says bending and beaming stiffness of the Magna International Inc. frames have been improved 92% and 20%, respectively, enhancing torsional stiffness of the fully boxed sections by a factor of five. Those improvements translate into better suspension tuning, ride quality and durability. New engine mounts reduce noise, vibration and harshness from the diesel engine, while the HDs borrow a page from GM’s light-duty playbook by adding hydraulic body mounts at the rear of the vehicle to tame freeway hop at higher speeds. GM engineers completely redesigned the front independent suspension, beefing up components to a 6,000-lb. (2,721 kg) front gross axle-weight rating. That’s a 25% improvement over the previous model and now makes all 4-wheel-drive versions capable of snow-plow use. In the rear, GM replaces the pickup’s semi-elliptical suspension design with a new asymmetrical leaf-spring setup. Again, parts are bigger and strong to handle the extra torque of the revamped Duramax diesel. Rear-weight ratings on 2500HD models improve a slight 2% – to 6,200 lbs. (2,818 kg) from 6,084 lbs. (2,765 kg) – while greater leaps are made with the 3500HD, where dually models post a 14% gain to 9,375 lbs. (4,261 kg). GM promises a maximum towing capacity with a fifth-wheel hitch on the beefiest dually models of 20,000 lbs. (9,072 kg), or 2,300 lbs. (1,043 kg) over the previous model. The conventional ball-hitch tow rating on the full range of dually models improves to 16,000 lbs. (7,257 kg), or 3,000 lbs. (1,360 kg) better than the ’10 version. Payload capacity grows to 6,335 lbs. (2,874 kg), a 1,000-lb. (454 kg) improvement. GM does not release fuel-economy specifics on the fourth-generation Duramax diesel (the auto maker offers as standard equipment an updated 6.0L V-8 engine providing more torque lower in the rpm band, mated to a strengthened Hydra-Matic 6L90 6-speed automatic). However, the engineers assembled here promise an 11% improvement over the third-generation Duramax diesel, for a combined-cycle 19 mpg (12 L/100 km), as well as a 63% reduction in oxide of nitrogen emissions. The NOx reduction comes courtesy of a new selective catalyst-reduction after-treatment system. GM expects a range of about 5,000 miles (8,000 km) between urea fillups. Horsepower and torque numbers remain under evaluation, although they will exceed the previous model’s 365 hp and 660 lb.-ft. (895 Nm), engineers say. The new HDs also receive a 36-gallon (136-L) fuel tank, which is up to 10 gallons (38 L) more than some of the older models. The bigger tank will help contribute to a range of 680 miles (1,094 km). “That’s a long day’s work,” says Gary Arvan, chief engineer, Duramax diesel. He also says the new Durmax will run on 20% biodiesel fuel and that an engine block heater is not needed on the oil burner to -20° F (-29° C). Other technological highlights of the redesigned Silverado HD include trailer-sway control to keep the truck and trailer headed in the same direction; larger brakes with stiffer, stronger calipers; and a standard exhaust brake on Duramax models to prolong brake life and prevent overheating on long downhill tows. GM will build the new heavy-duties at assembly plants in Flint, MI, and Fort Wayne, IN. Addressing an all-new 4.5L V-8 Duramax turbodiesel planned for light-duty ’10 Silverado and Sierra pickups but shelved by GM as it buckled down for bankruptcy, Scheidt says the uniquely designed engine remains on the shelf for now. GM spent three and a half years developing the 4.5L diesel and had hoped to include the compact, lightweight engine in future cross/utility vehicles, SUVs and even some cars.